- a DVR System (digital video recorder) to record your choice of cameras with using BNC video over a variety of cable options. Traditional DVR or CCTV systems are commonly referred to as "analog," and do not consist of any HD camera capability beyond 1000 TV- Lines. The maximum recording resolution of a traditional DVR system is 960H, which is slightly better than D1. Read our blog about why 1000 TV-Line Cameras and 960H DVR Systems don't compare to HD systems in terms of value or effectiveness. - an HD-SDI DVR System to record your choice of HD cameras at 720P (1.3 megapixels) or Full HD 1080P (2.1 megapixels) over high-quality coaxial RG59 or RG6 cable. This is a popular option for those who are upgrading existing systems which have quality coaxial cable already installed. The very thin coaxial or Siamese cable (usually pre-made lengths) will not transmit an HD signal. And if the cable's distance is beyond 100-150 feet, an HD-SDI extender may have to be used. HD-SDI transmits a digital HD signal over coaxial cable, and as a result offers higher quality over HD-TVI, HD-CVI, and AHD. Quality is on par with IP Network Camera Systems, but resolution is limited to 1080p. Another big advantage of HD-SDI over IP is much easier implementation and no need to look for compatible camera makes and models with HD-SDI. The best value HD-SDI systems are our Magic-Lite HD-SDI systems. - an HD-TVI DVR System to record your choice of HD cameras at 720P (1.3 megapixels) or Full HD 1080P (2.1 megapixels) over coaxial RG59 or RG6 cable, or network cable (UTP, Cat5, Cat6) while using HD video baluns. This is a popular option for those who are upgrading existing systems which have questionable quality coaxial cable or network cable installed. HD-TVI tribrid systems can also accommodate compatible IP cameras, whether wired or wireless using wireless access points. It should be noted that starting in 2015 with the lower cost of HD-TVI cameras, you get the most value (pixels per dollar) using HD-TVI, and this is why most analog systems on the market are now HD-TVI/analog hybrid systems. HD-TVI has less requirements to HD-SDI, and is as easy to deploy as HD-SDI. Picture quality is slightly less. Price is generally 20-30% less. Also available are Hybrid and Tribrid DVR Systems, which can support combinations of the following types of cameras: analog, HD-SDI, HD-TVI, HD-CVI, AHD, and IP/Network cameras. The best value DVRs are currently our LTS Platinum tribrid DVRs, which offer the ability to connect any combination of HD-TVI and analog cameras, as well as additional IP cameras up to 1080p. 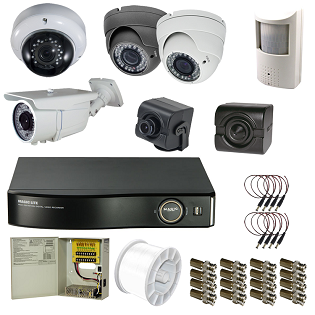 - an NVR System (network video recorder) to record your choice of IP cameras at resolutions up to 40 Megapixels per camera. Actual resolution limited by the NVR, NVR's bit rate, Video Management Software (VMS), and IP camera. The best value Embedded NVRs are currently our LTS NVRs and Hybrid DVRs. The Hybrid DVRs can accommodate both analog and IP cameras. The best value PC-based Enterprise NVRs are custom-built by eDigitalDeals and use the Milestone XProtect VMS. Pre-configured by our server technicians, these NVRs come standard with remote support, as well asoptional LPR (license plate recognition), Access Control, and POS Text Overlay integration.